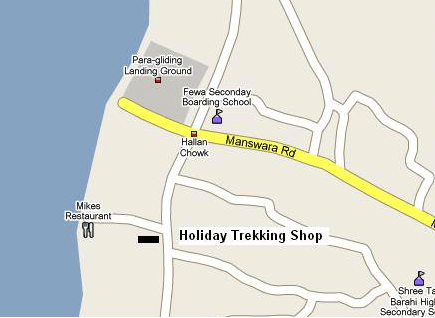 Visit our Holiday Trekking Equipment Shop on the Lakeside in Pokhara. We have a large supply of trekking equipment and supplies for sale and some for rent. We are located about 200m south of the Manswara Rd. on the west (lake) side. You will find us opposite the beautiful shade tree and Tea Time restaurant. See map.